Danny Andrew scored from a freekick for the second successive home game. There’s still time for a couple of twists and turns and the race for sixth spot is anything but cut and dried. But Doncaster Rovers have the look of a side determined not to let their pass to the play-offs slip from their grasp. And on current form, having completed a fourth straight win against struggling Plymouth Argyle with minimum fuss, they are approaching the end of season lottery with their tails very much up. There is still plenty of work to be done and, as is usually the case, the Easter weekend could prove to be pivotal. Rovers remain five points clear of seventh-placed Peterborough United who have a game in hand (against Portsmouth). Their latest home win nudged them up to 69 points (74, on average, has guaranteed a shot at the play-offs over the last ten years). And they brushed the Pilgrims aside in a fashion which suggested that they really mean business. The dynamic will change slightly over the Easter period when Peterborough will twice kick off ahead of Doncaster. 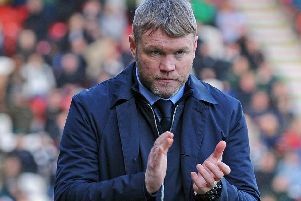 Posh go to Fleetwood on Good Friday before Rovers face their hardest game of the run-in, at least on paper, at Sunderland in a tea-time televised slot. 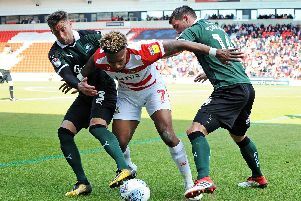 Darren Ferguson’s side then host Sunderland on Monday before Doncaster welcome Accrington Stanley to the Keepmoat Stadium the following evening. It’s an opportunity for Peterborough to crank up the pressure and close the gap. But everything about Rovers’ performance on Saturday suggested they can cope with whatever is thrown at them. With talisman John Marquis sidelined due to the concussion protocol, and Rovers coming off the back of an uncharacteristically poor display at Bradford City, there might have been some apprehension among the Keepmoat faithful in the build-up to this game. That worry might have grown after Antoni Sarcevic almost side-footed home within seconds of the first whistle. But from the moment Tommy Rowe lashed Rovers into a seventh minute lead – the third successive home game they have scored in the opening ten minutes – there was absolutely no need to fret. Rovers went about their business in a controlled, efficient manner. They were bright on the ball in the first half and combative off the ball in the second period. Plymouth weren’t as bad as their manager made out. They carried a threat on the break but were snuffed out time and time again by outstanding centre half duo Andy Butler and Paul Downing. Rovers carried more of a threat and they took a firm grip on the game just before the break when Danny Andrew swept home a delightful freekick from distance, beating a red-faced Matt Macey at his near post. That proved to be the end of the scoring but Rovers showed another side to their game after the break as they rolled up their sleeves, rebuffed Plymouth’s advances and got the job done. McCann’s men really do mean business. Marquis, with 23 goals to his name this term, had a watching brief. Ben Whiteman, a stand-out performer this season, was still missing. And unlucky Tom Anderson, outstanding in the backs-to-the-wall win at Bradford, picked up an injury in training. Yet Rovers adapted superbly and never really looked like not winning this game – which is testament to the work of McCann. Downing slotted in seamlessly at centre half, just like Anderson had done for him at Valley Parade. Mallik Wilks showed a growing level of maturity to cover for Marquis in the central striking position. And the brilliant Herbie Kane recharged and refreshed Rovers in midfield, helping also to bring the best out of Rowe. Rovers are in a good place right now – sixth place. And they are in no mood to let that slip.